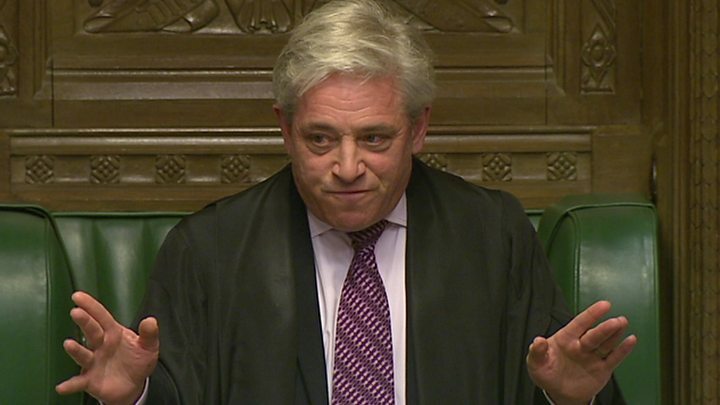 Media captionSpeaker John Bercow said addressing Parliament was "not an automatic right"
Commons Speaker John Bercow has defended voicing his opposition to Donald Trump addressing Parliament. His comments, including accusing the US president of "racism and sexism", had been made "honestly and honourably" and were within his remit, he told MPs. Several Conservatives have criticised the Speaker, one saying his career could be in "jeopardy" and another that he had damaged the national interest. Downing Street called his comments "a matter for Parliament". The US president has accepted an invitation from the Queen for a state visit to the UK, which can include an address to both Houses of Parliament, later this year. However, responding to a point of order in the Commons on Monday, Mr Bercow said he was opposed to Mr Trump speaking to MPs and peers - as some other international leaders have done. He said it was "not an automatic right", but an "earned honour", to applause from Labour and SNP MPs. Questioned in the Commons on Tuesday about his remarks, he replied: "The House has always understood that the chair has a role in these matters." He added: "I was honestly and honourably seeking to discharge my responsibilities to the House." Mr Bercow said it was time "to move on to other matters". Conservative MP Sir Gerald Howarth said there had been a "rather subdued aspect" among his party's MPs when Mr Bercow had spoken. He added: "I do hope that you will help us to ensure that we can have full confidence in your impartiality, because that's the way for the House to proceed." The "relationship between the United Kingdom and United States is an extremely important one", Sir Gerald also said. However, Labour MP Paul Flynn said the Commons owed Mr Bercow "a debt of gratitude for deciding that in this case such an invitation should not be supported by this House." And SNP MP Alex Salmond, who had several run-ins with Mr Trump when he was Scottish First Minister, told Mr Bercow: "If ever a statement deserved clapping, then yours did yesterday." Mr Bercow is one of three "key holders" to Westminster Hall - where Mr Trump's predecessor Barack Obama spoke in 2011 - along with the Speaker of the House of Lords, Lord Fowler, and the Lord Great Chamberlain, a hereditary peer in charge of certain parts of the Palace of Westminster. All three must agree in order for an address to take place there. Lord Fowler addressed peers on Tuesday, saying Mr Bercow had not informed him ahead of voicing his opinion on Mr Trump, adding that Mr Bercow had told him he was "genuinely sorry" for this. He added: "I don't intend to argue the case for or against Mr Trump's visit. That's not my role as Speaker. "But let me say I have spent the last 30 years campaigning against discrimination, particularly against LGBT people and people with HIV/Aids." As speaker, Mr Bercow is the highest authority of the House of Commons and must remain politically impartial. Several senior Conservatives have been highly critical of his comments. One unnamed Tory MP and former cabinet member told the BBC he "must be close to standing down" as Speaker, while another said his remarks had gone "way beyond what is acceptable". Conservative MP Nadine Dorries said: "When he loses support for what was a very partisan moment I think his position will become more and more in jeopardy." Crispin Blunt, the Conservative MP who chairs the Commons Foreign Affairs Select Committee, said Mr Bercow was going to have to deal with "the consequences" of his comments. He added that the Speaker, "who's meant to referee all of this, should keep himself above that". Former Culture Secretary John Whittingdale told Sky News: "It was a performance, it was John Bercow playing to the gallery and I think it was damaging to the national interest. I think it is regrettable that he did it." Fellow Conservative Nadhim Zahawi, who has been critical of Mr Trump's travel ban on nationals from seven mainly Muslim countries, said the Speaker prided himself on his neutrality and to become the story was "a bad place to be". He said Mr Bercow had opened himself up to accusations of hypocrisy after allowing other controversial leaders, like the Chinese president, to speak, and urged him to explain his thinking to MPs. Meanwhile, Joe Wilson, a Congressman for Mr Trump's republican Party, told the BBC's Newsnight programme Mr Bercow's interjection had been "very disappointing". "If ever in recent years there's been a more pro-British president of the United States, it's Donald Trump," he said. Former UKIP leader Nigel Farage said Mr Bercow had "abused his position" and that to have expressed his opinions in the way he did "devalues this great office". But Labour leader Jeremy Corbyn, who has called for the state visit to be postponed, welcomed the intervention, while Liberal Democrat leader Tim Farron said Mr Trump was "not welcome". A petition to withdraw the invitation to the US president - and another one backing the visit - will be debated by MPs later this month. No date for Mr Trump's visit has been announced.